In Old Alresford, the Church of St Mary the Virgin is famous for its associations with Mary Sumner, the Founder of The Mothers’ Union, in 1876. 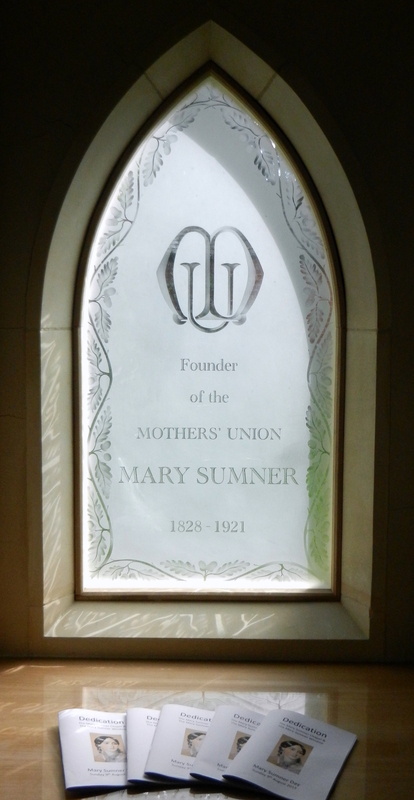 Recently a new chapel and window in the Church has been dedicated to the memory of Mary Sumner: this was on 9th August 2015, 100 years after the laying of the foundation stone for Mary Sumner House in London, their first HQ. Preparations are now being made by the Mothers’ Union, now an active, world-wide organization, for a celebration of the 140th Anniversary of the foundation of the movement on 9th August 2016. Inside the Church there is also a plaque on the wall commemorating her life and achievements, plus the banner used by the Alresford Deanery branch of the Mothers’ Union, now returned after being lost for many years. Her story has been much reported elsewhere, notably by Lesley Drew in Alresford Displayed in 1991, which is reproduced below, with permission. The history of the Mothers’ Union presented on a display board in Old Alresford Church, which is where the photo of Mary was taken, also suggests that the final trigger for Mary’s ideas came when she first became a Grandmother, in 1876. 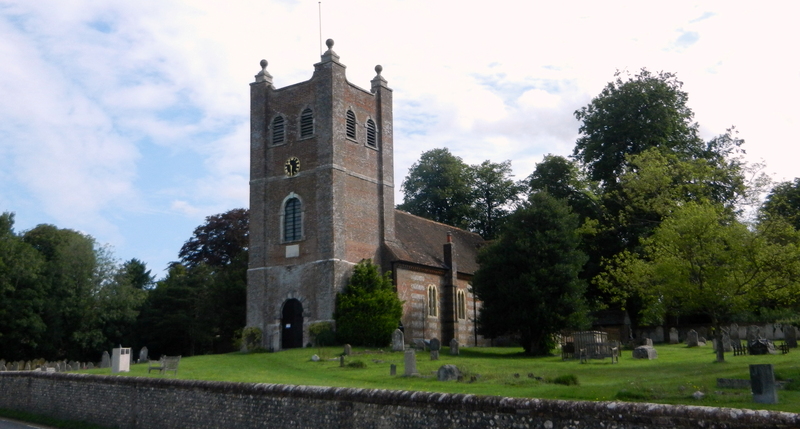 The Church of St. Mary the Virgin, in Old Alresford, stands high, looking out over open Hampshire countryside. Just a country church, with nothing particularly striking about its exterior to make the casual motorist consider it worth stopping. The former rectory, now the Winchester Diocesan Retreat and Conference Centre, is barely discernible through the trees. Yet on four occasions a year, both the House and the Church are the scenes of pilgrimage by hundreds of women from many parts of the country. These are the days specially set aside by the House, to welcome members of the Mothers’ Union, for it was in its gracious drawing room in 1876, that the wife of the Rector of Old Alresford, Mary Sumner, held a gathering of women. The aim was that they should guide, assist and teach one another in the ways of Christian family life. Mary, very simply, named the group as ‘The Mothers’ Union’. There was nothing to suggest to Mr and Mrs Heywood, living near Manchester, that their third and last child, a daughter, born on December 31, 1828, would prove to be exceptional in any way. Named Mary Elizabeth, she led an exceedingly happy and secure childhood in Leicestershire, to where they moved when Mary was four. The children were educated by governesses, and by their father, but it was from her mother, who created the deeply happy home, that Mary learnt to love the Lord. The Heywoods enjoyed foreign travel, and it was while they were wintering in Rome in 1846, that Mary met George Sumner, her future husband. George Sumner, the youngest son of the Bishop of Winchester, was training for ecclesiastical life. On returning to England, he became a curate at Crawley, and a year later was ordained a priest. The same year he married Mary Heywood, a marriage which was to be described by Mary in the words “The union turned out to be a most perfect and ideal one, and has been one long period of unalloyed happiness”. Shortly after their marriage, George Sumner’s mother died, and at the request of the Bishop, Mary and George moved to Winchester, where George became domestic chaplain. In 1851 George Sumner was given the living of Old Alresford. 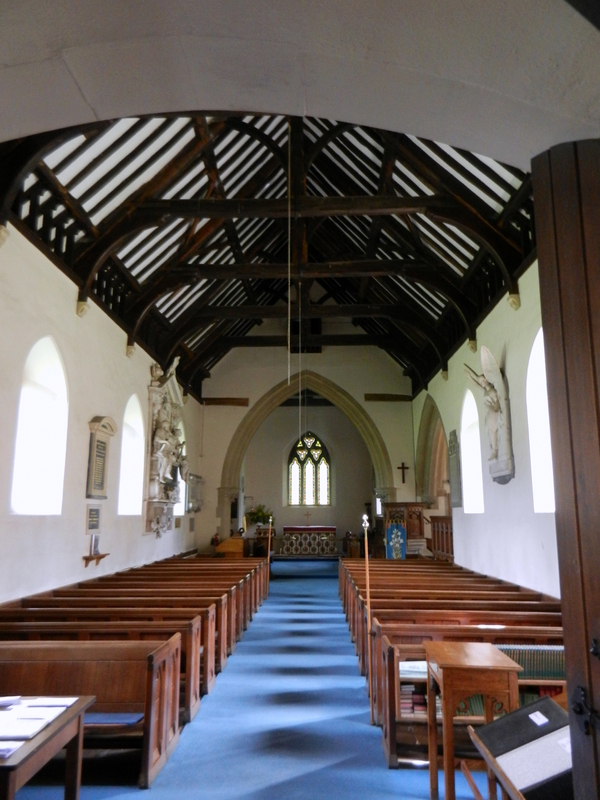 Mary’s life at Old Alresford was very full and happy, caring for her husband and three children, and supporting her husband’s work in the parish especially among the women and children. From the time of the birth of her first child, Mary had become acutely aware of the great sense of responsibility of parenthood, not only the care of the bodily well-being of her child, but also the spiritual and moral training. She felt an inadequacy and in need of advice. Having herself had all the advantages of life, she pondered about mothers less fortunate than she. Could there be a way of binding them together into a fellowship of Christian mothers, willing to learn in order that they might be able to teach and train their children to be followers of Christ? If mothers, the world over, could be brought together united in prayer and with common purpose and rules, so much could be accomplished. The years passed. Her children grew and left home, and her husband was increasingly occupied with Diocesan affairs. Now she had the time and opportunity to put forward her ideas of a union of mothers. Some forty women from the village were invited to a meeting at the rectory. By nature a shy person, Mary’s nerve failed her, and she was too nervous to face them. Her husband took the meeting. Shamed at her failure, she invited them the following week, and never again did she allow her shyness to interfere with her purpose and duty. She was to become a powerful and inspiring speaker. These weekly meetings were popular and husbands also joined. Mary Sumner’s aim however, was to achieve far more. In 1876, at her own expense, she had fifty cards printed, intended for the use of those attending meetings. They included practical suggestions for child training, dedication to Christ, strength through communion, and a prayer, which to this day has remained the Mothers’ Union prayer. The Union grew, though still confined to the village. Then in 1885 came a move from Old Alresford to Winchester, where George Sumner became Archdeacon. Before the move, Mary accompanied her husband to a church congress in Portsmouth. An evening meeting for women had been arranged, with various male speakers – women did not in those days take part in such activities. Unexpectedly, the Bishop of Newcastle had the idea of asking Mary to speak, and indeed almost ordered her to do so. Mary “spoke” on “That which meant most to her: the bringing together of wives and mothers of all classes to unite in prayer, and help raise the home life of the nation”. As a result of the meeting, The Mothers’ Union was founded as a Diocesan organization in Winchester, with Mary Sumner as president. Ten years of ceaseless work was to follow. She organized, planned and traveled, addressing meetings everywhere. By 1887 in the Winchester diocese alone, fifty seven branches were in existence, and a first conference of The Mothers’ Union was held. From then on it was rapid growth both at home and overseas, and in order to circularize members everywhere, a journal was begun, grew and expanded. In 1890 a second magazine was produced. In 1896 a central constitution and central council were set up with headquarters in London, in a church basement. Mary Sumner acted as central president until 1909 and worked tirelessly. During this period George Sumner had been consecrated Bishop of Guildford. In 1908 the Sumners celebrated their diamond wedding, and soon after this came the first great Mothers’ Union mass meeting in the Royal Albert Hall, when Mrs Sumner, despite her great age, spoke with eloquence. Bishop Sumner was – by now – very frail and ailing, and in 1909 Mary resigned as central president. In December that year her beloved husband, companion and adviser for more than sixty years, died. Few people can have been less hampered by old age than Mary Sumner. In 1913, at the age of eighty four, she undertook a tour of northern towns, addressing meetings in a programme which would have wearied many a younger woman. Then came World War I and activities were restricted. After thirty years service, in 1916, she resigned her position as Diocesan president of Winchester, though in her speech at the time she expressed her wish to continue to be of service to the Mothers’ Union. She did, by assisting in the planning of religious education work. On her 90th birthday in 1918, loving greetings came from far and wide to Mary, including a signed photograph of the Queen. She addressed her last Mothers’ Union meeting at Botley, in the garden of her daughter’s home, in the summer of 1919. Her last two years were spent peacefully either among her children, or quietly at Winchester. Mary Sumner died on 11th August 1921 after her whispered words ‘Abide with me’. 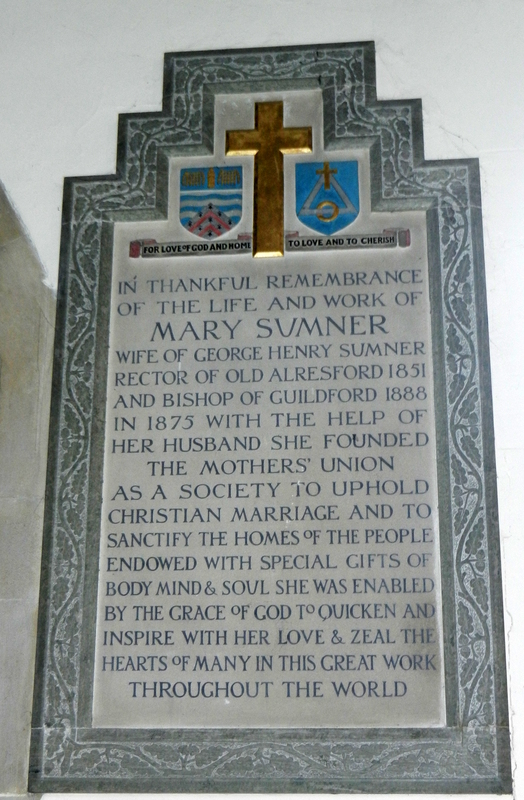 Today a simple plaque in the parish church of St. Mary, Old Alresford, commemorates the life and work of Mary Sumner. Written by Lesley Drew, for Alresford Displayed, in October 1991, with acknowledgment to the Mothers’ Union Headquarters, in London, for details of the life and work of Mary Sumner.